My food tab has been a bit empty lately, but not to worry - my tummy is still full! Even though we follow a pretty traditional Italian diet at home, I'm all for the occasional green smoothie or bowl of quinoa. Believe it or not, I'd probably take some plain yogurt topped with berries, granola and honey over anything else. 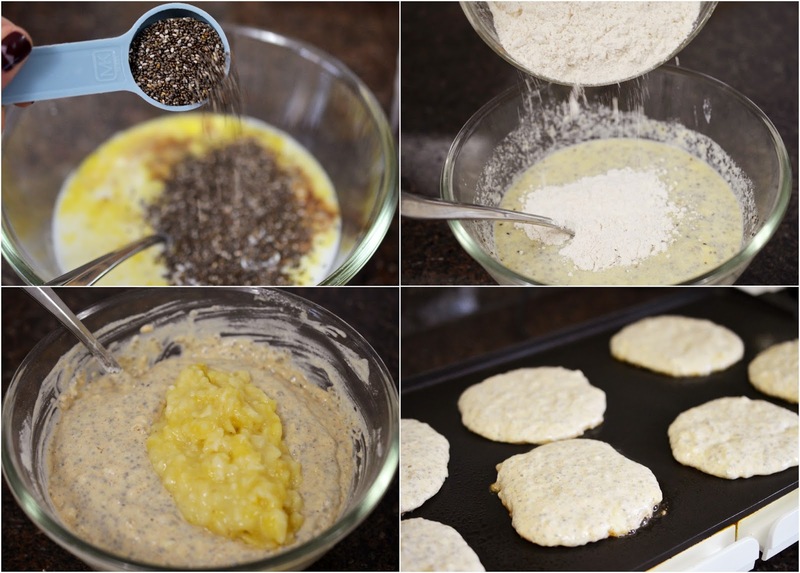 When I was emailed about Prana's newest product, a Canadian brand of supercharged chia seeds, I immediately turned to Pinterest to find the best banana chia seed pancake recipe out there. I featured chia pudding once before on my site (recipe here), and I still enjoy making it from time to time. In a small mixing bowl, mix together butter, honey, milk, yogurt, egg, vanilla extract, and chia seeds. Set aside for approximately 5 minutes (the chia seeds will begin to start absorbing liquid during this time to make them a little softer). In a medium mixing bowl, mix together flour, baking powder, salt, and cinnamon. Heat a skillet over medium heat until hot. 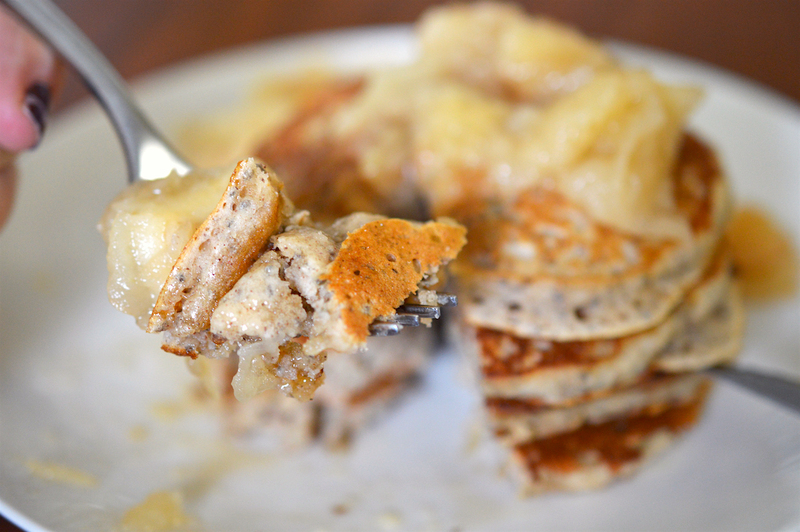 Melt ½ tablespoon butter in it, and spoon approximately ¼ cup of batter into skillet for each pancake. Because the batter is a bit more dense than traditional pancakes, I recommend using a wooden spoon or spatula to smooth out the top to create a thinner pancake. This will ensure that it cooks the whole way through without burning the outside. When edges begin to look cooked, use a large spatula to flip the pancake quickly. After only a minute or so, the pancake should be cooked. Remove cooked pancakes to a plate and continue cooking in batches until the batter is gone, using ½ tablespoon more of butter to fry each batch. 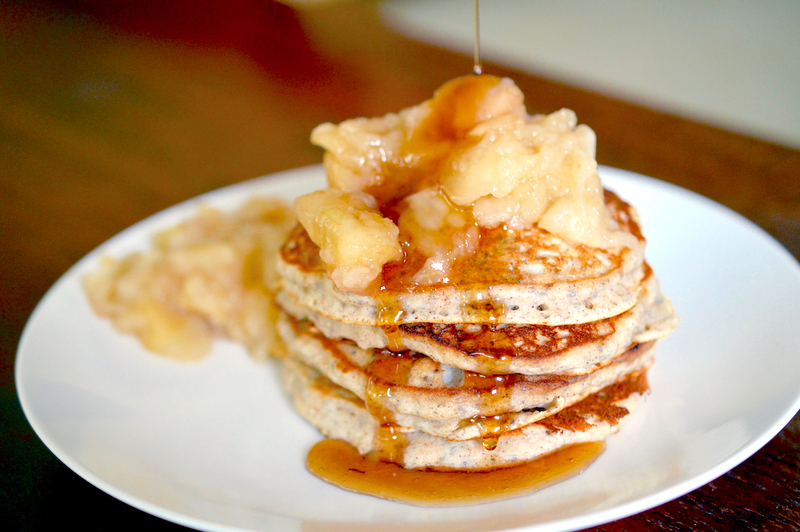 Top with cooked apples, maple syrup, and enjoy! These pancakes were absolutely delicious. Our batch was quite large, so we froze a stack as they were just as yummy the second time around. I can't believe that these are actually healthy, since they tasted way better than any EGGO waffle or high-calorie muffin. Prana ProactivCHIA comes in two varieties: 284 g (whole) and 200 g (ground) which cost around $7.99 each. ProactivCHIA whole and ground can be found at all major grocery chains, health food stores, and supermarkets with healthy living aisles across Canada. For more information and recipe ideas, visit the Prana Bio site here. 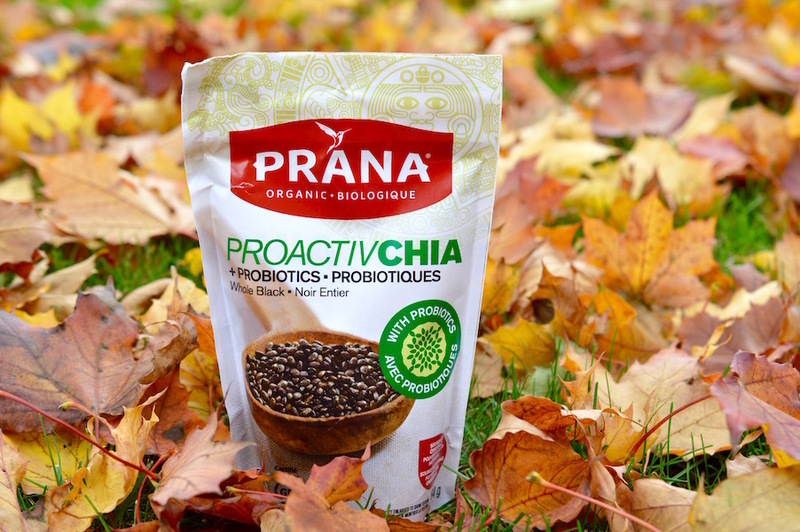 PRANA is a Quebec company that manufactures and markets healthy snacks, nuts and dried fruit, as well as chia seeds – all certified organic, Kosher, vegan, preservative-free, gluten-free, GMO-free, sulfite-free and, above all, free of compromise. This bag of ProactivCHIA was sent free for review. Wow! Looks so yummy! Thanks for sharing!